Matcha has been quite the buzzword in the tea world in the last few years....from lattes at Starbucks to spicing up recipes for cupcakes, ice creams, protein shakes and more. The World of Tea agrees that this trend shows no signs of slowing... matcha-only restaurants are popping up and thriving in cities such as Los Angeles and New York. Not only is matcha at the forefront of an exciting new umami-flavored drink, but it is also chock-full of health benefits. Rather than just infusing tea leaves, matcha takes the entirety of the green tea leaf, dries it, and grinds it into a powder that contains even more nutrients than green tea. This is because instead of drinking tea-leaf infused water, you are consuming the leaves themselves. Green teas have also been linked to lowering levels of bad LDL cholesterol as well as lowering high blood pressure. Matcha also serves as a happy medium between tea and coffee. The powder contains more caffeine than green tea, but still less than coffee. Of course, if a coffee drinker is looking for an extra kick, you can still add a shot of espresso to a matcha latte. Matcha doesn't require a lot of product per serving (typically 1 teaspoon). But our experience has shown that getting a large 1lb or 1kg bag is not ideal for cafe settings. You could in theory scoop out some tea and put it in a tin or other small container. But this process is very messy. And the remaining product is now open and exposed to air, lowering the shelf life. Our packages are resealable and easy to use and store. Not only is our packaging size more sensible, but our prices are cost effective. The 3.5 oz packages amount to about 22 servings of matcha. 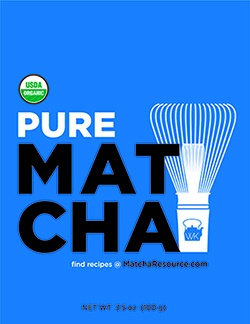 At $9/package wholesale that means a matcha drink is costing you only 40 cents a cup! With typical matcha beverages costing in the $5 range, it's great for your bottom line! Enjoy the possibilities with flavored matcha! 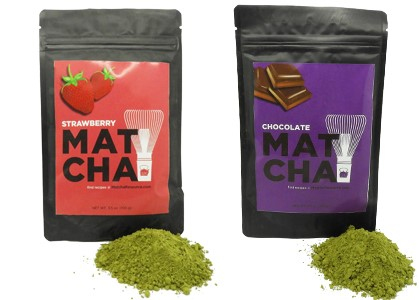 We offer 11 different flavors and grades of matcha such as vanilla, chocolate, chai and strawberry. Not only do these flavors make enticing drinks, but you can explore different flavors without having to commit to 10+ pounds of matcha. Check Out Our Matcha Selection! Please complete the form below for pricing options and more information on our matcha wholesale program!